CTCA is highly accurate at detecting stenoses in bypass grafts with sensitivity, specificity, negative and positive predictive values of 97%, 97%, 93% and 99%, respectively.3 The limitation of CTCA in patients with CABG is in the assessment of the native coronary arteries distal to the grafts and the coronary arteries that did not receive bypass grafts at the time of CABG, as they tend to be heavily calcified and often of small calibre. 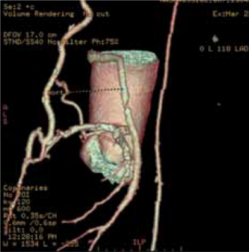 This has limited the use of CTCA in CABG patients. However, invasive coronary angiography (ICA) in these patients can be a long and difficult procedure, particularly if both internal mammary arteries (IMA) have been used, and is associated with use of larger volumes of contrast and higher radiation doses than routine diagnostic ICA for native coronary arteries, which is a simple procedure comparatively. Furthermore, cardiac catheter manipulation to engage the IMA grafts is associated with a small risk of embolic strokes or dissection. The following case demonstrates the useful application of CTCA to identify and assess grafts in a 79-year-old man with CABG who was admitted to a district general hospital with acute coronary syndrome where he had a prospectively gated CTCA to identify and assess his grafts (figures 1–3). This demonstrated a patent left IMA to left anterior descending (LAD) artery, a patent right IMA to distal right coronary artery (RCA), both with good run offs, a moderate stenosis in the middle of the saphenous vein graft (SVG) to obtuse marginal branch (OM), with a patent stent in the distal end of the vein graft with a good run off. A focused invasive coronary angiogram confirmed proximal total occlusions of the LAD, circumflex and RCA, and the moderate stenosis in the vein graft, which did not need interventio. Meijboom WB, Van Mieghem CA, Mollet NR et al. 64-slice computed tomography coronary angiography in patients with high, intermediate, or low pretest probability of significant coronary artery disease. J Am Coll Cardiol 2007;50:1469–75.